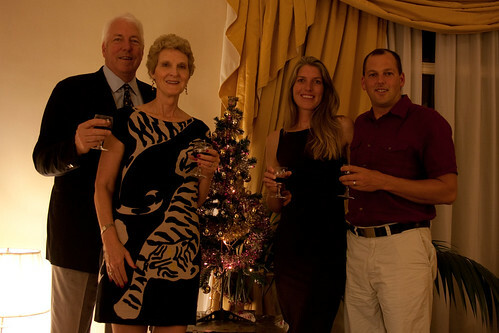 Since my father and his wife Joyce were visiting us in Buenos Aires for Christmas, we checked in to the luxurious downtown Plaza Hotel to await their arrival. For the last week of our sixteen months in South America, we would be living at a very different standard than we had become accustomed to. Uniformed attendants opened the polished brass doors as we entered the marble lobby and a bellman took our bags to our room. Our suite of rooms was just slightly smaller than our apartment in San Francisco, and I leapt on to the fantastic bed (complete with down mattress cover and eight fluffy pillows) as Chris turned on both of our flat screen TVs. To get in to the Christmas spirit, we went to a nearby dollar store and bought the best plastic Christmas tree, lights, and sparkly bangles $15 can buy. Despite the snow storm that shut down most of northeastern US travel for 24 hours and resulted in the cancellation of their flight, Dad and Joyce managed to catch a flight only a day later than they had originally planned. 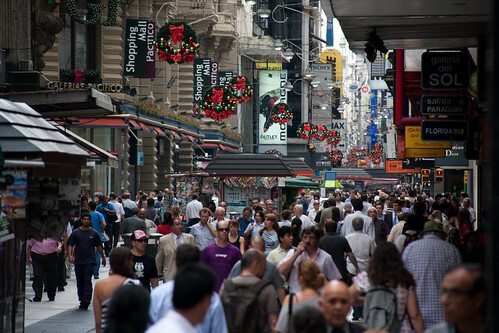 After they arrived in Buenos Aires, we immediately hit the packed streets around our hotel for a little shopping. Buenos Aires is known for its cutting edge fashion as well as inexpensive leather products, so we wandered the streets for a couple of hours, avoiding the stores with agressive hawkers inviting their 'friends' in for a 'special bargain.' In addition to the fantastic shopping during the day, we ended most evenings enjoying fine wine and food. My father quickly settled in to a routine of ordering a refreshing white Torrontés to accompany appetizers and a rich Malbec to compliment huge steaks. While taking a tour of the city to get a feel for its many different neighborhoods, we stopped at the Cementario de la Recoleta. 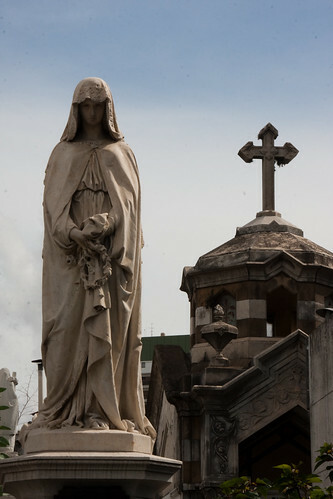 This elaborate cemetery guards the remains of Buenos Aires' elite families who pay dearly for some of the most expensive real estate in Argentina. Walking the narrow alleys of the cemetery we recognized names that are commonly used for streets in any town in Argentina, such as Sarmiento, Mitre, and Alvear, but we were headed for the cemetery's most visited resident: Evita Peron. Luckily when we visited the cemetery, it was almost empty. We visited her grave without waiting in a line that can stretch around the corner. Some mausoleums were constructed from immaculate marble with elaborate statues guarding the entrance of tombs complete with stained glass windows. Others were crumbling into rubble, the tomb's entrance a mess of broken glass and wooden shards. 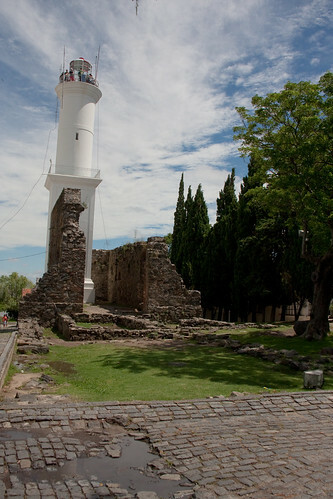 We also took a one-hour boat ride across the mouth of the Rio de la Plata to visit the exquisitely preserved town of Colonia de Sacramento, Uruguay. The oldest town in Uruguay, it was originally settled by Portugal in 1680, and changed hands many times between Portugal, Spain, and Brazil before the entire independent country of Uruguay was established in 1828. We wandered its rough cobble stone streets, peeked in some preserved homes, and enjoyed a quiet lunch on the main town square before heading back to Buenos Aires later that afternoon. We spent our last day in Buenos Aires with my parents wandering the picturesque streets of the San Telmo neighborhood. Every Sunday this area hosts a huge antiques fair, complete with tango dancing demonstrations and empanada vendors on every corner. 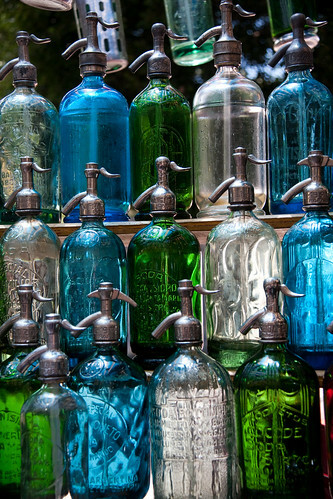 We lingered over some beautiful old seltzer bottles, as well as soon cool gaucho equipment, but decided our bags were already too full to fit just one more thing. 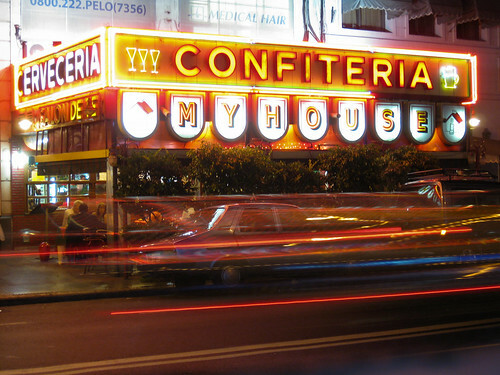 After they left that night, we spent another 48 hours in Argentina before heading to the airport ourselves. And now, this is it: our last blog post from Latin America. At 5:30 am December 30th we took off from Buenos Aires International Airport on a flight (via Panama City, Panama and Houston, Texas) to Miami, Florida. I never thought I would say this, but I'm ready to stop traveling for a while. We are looking forward to some quality family time in the United States as we figure out what we want to do with our lives. Taking this trip has been one of the best things we have done with our lives, and I know it has permanently changed us. Still to come for those who are interested: a greatest hits list, and an estimated budget for those considering a similar trip. Thanks for reading our blog and sharing the last 18 amazing months with us. Like Nick, I followed your entire trip and loved every post. But I'm not considering a similar trip--could only do it vicariously and your blog let me do that. Thanks and I hope we'll see you in Minnesota! Thank you both for sharing your wonderful adventure. I wish you the best in 2010 and beyond. Maybe our paths will cross someday. If you are ever wandering through Alaska, let me know. John Gish knows how to contact me. Wow - what an adventure. I'm sad that I am not going to hear any more about it, I loved living vicariously... But as a previous person hinted at, perhaps there will be a future voyage north. I mean, can you really drive the Americas when you skip a critical state?